Santa Teresa 1796 Antiguo de Solera gets a lot of attention, but recently opened a bottle of Santa Teresa Gran Reserva and poured some over ice and wonder why I don't drink more of this rum, on the rocks. Ice attenuates the flavor profile of the rum but didn't want to sip anything straight tonight while I finish up some work and enjoy the second half of Sunday night football. There's a little butterscotch in the initial taste that leads into the warm body, in spite of the ice, laced with hints of cinnamon, baked banana, cashew and a slight smoky cedar and oak wood note followed by a smooth smoky finish that lingers longer than expected and invites another sip. I've been enjoying this rum since the mid-90s when I'd buy it in Margarita Island before heading north at the end of hurricane season. Even after more than 10 years, I'm pleased to taste a rum I enjoyed years ago and that I still enjoy. I have really enjoyed this rum as well. It is a staple in my cabinet. Why don't you open up a store in Houston of hard to find Rums? Texas isn't big enough for me and the retail and distributor laws in that state. Actually I don't ever see myself having a retail store anywhere, except maybe on a free island somewhere between 19° N and 19° S latitude. And under the alcohol distribution in the freest country in the world you can't be an importer and have a retail store. Oh well. Exactly Ed...One needs to set up a "shell store front"...Brookline Liquor Mart in Boston was once that for Classic Wine Imports of Boston. I believe they have been absorbed some time ago. 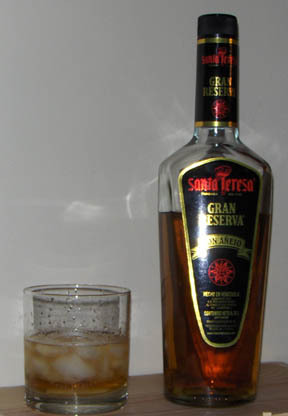 Gran Reserva Santa Teresa is a classic and emblematic rum in Venezuela. Here in the country people use it a lot to prepare Cubalibre but I agree with Ed that you can enjoy it just with some ice. I would end my post saying that this rum is also once of the most appreciated in Venezuela so if any of you have a chance to stop by the country don't forget to buy a bottle of this one...it is a must and price is very afforable.